I always struggle with my rough dry hair and find different methods, home remedies to turn them into soft, shiny and silky hair. After trying tons of hair shampoo and anti hair fall cleansers, I finally came to know about this new brand SO SILK SHAMPOO, which contains the extracts of SOY, which plays the main role in the quality of your hair. I know this is not so popular brand, but after trying this So Silk Shampoo I had to share this with you. Take a look at this So Silk Shampoo below. What So Silk Shampoo Hair Cleanser Claims? 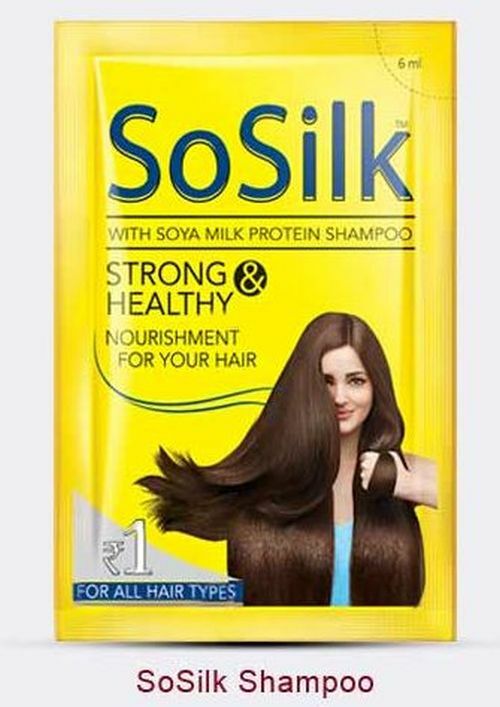 SoSilk Shampoo is a cream shampoo with Soya Milk Protein. Designed for allhair types, this Shampoo is special in many ways, mainly owing to its soya milk protein formula. Proteins are very much a part of hair, they are much needed nutrients for good health, particularly for the hair. SoSilk Shampoo nourishes your hair and makes them strong & healthy. Recommended for its beneficial effect on weak and brittle hair, soya milk protein not only improves tensile strength of hair, but also removes impurities off the hair. Soya milk protein is a rich source of amino acids, antioxidants and omega-3-fatty acids. This cocktail of known hair nutrients, in SoSilk, leaves your hair strong enough to defend themselves from free radicals and sun rays. If you are also looking for a shampoo for smooth, soft, shiny & healthy looking locks, just go for SoSilk. 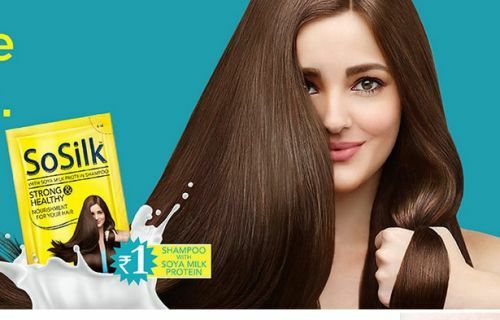 Make it your first choice for getting strong, lustrous & healthier hair, because soya milk protein makes this shampoo a unique product in its genre. PRICE - Rs 1/- per sachet. This So Silk Shampoo comes in yellow colored sachet and I think this is one of the main drawbacks of this hair cleanser since I never like using sachets unless I am travelling. I always like using a hair cleanser in pump dispenser big bottles, since they are so convenient and easy to use. I think every company should launch products in most possible sizes for user's convenience. This shampoo looks very similar to Tresemme Hair Fall Shampoo, being white creamy in texture. The smell of this is super amaing and cannot be judged as of such cheap shampoo. I actually love the fragrance very much. On application, the cleanser lathers well almost like any other cleanser with generous quantity required to cleanse entire hair. I just apply generous amount of shampoo, massage it all over and then rinse with cold water. I must say the shampoo does a wonderful job in cleaning the entire dirt, oil and dust in just a single rinse. I normally rinse hair twice with any shampoo for a squeaky clean bouncy feel but with this, I didnt have to do this twice unless my hair was super oily. In super oily hair as well, this So Silk shampoo, cleanses all oil from hair reflecting a very clean scalp. Overall I feel this So Silk Shampoo is a great Soy Hair Cleanser which does a wonderful job in cleansing hair removing all dirt, oil giving a sqeaky fresh feel with a refreshing fragrance. The only thing I could feel is that overuse of this shampoo could leave hair dry and tangled since it actually takes away all the oil quite nicely. So people with dry ends and hair might skip this or use a nice deep leave in conditioner for soft smooth silky finish. Cleanse hair nicely removing dirt and dust. Removes all oil from scalp. Gives a bouncy effect to hair. Texture is smooth and creamy. Comes at a very affordable price. Comes only in sachet form. Not so easily available online and offline. Might be little drying after over use for dry hair types. I gonna use this as of now. This is quite a decent shampoo. I like how it makes my hair feel, however availability is an issue and like you mentioned there is only sachet form available.